Friends, today’s PSD download is a set of “Request a Quote” form in Photoshop PSD format. The form design comes in 3 colors — Red, Blue and Green — in fully layered PSD format. The PSD layers of all the 3 form design are organized in 3 separate folders for easy editing of text, etc. 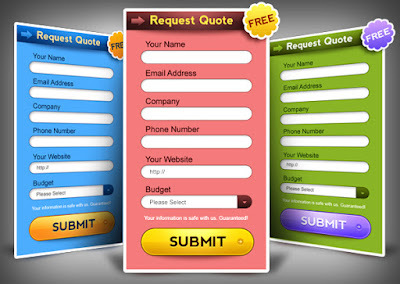 The quote form can be used in your web projects as a call to action form on your homepage or quote page. Download the PSD file and let me know your thoughts.